Bad news, Australia: It looks like you'll be playing the watered-down sissy version of Left 4 Dead 2 after all. 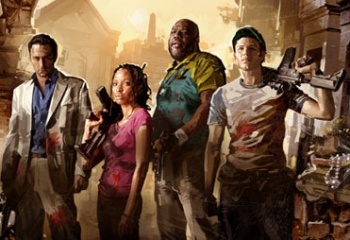 I'm not sure if it was much of a surprise when Australia's notorious Classification Board refused to classify the upcoming zombie shooter Left 4 Dead 2. The first game was ridiculously violent and the addition of melee weapons like axes and chainsaws is only going to up that ante. That, in fact, seemed to be the Board's biggest concern: The "close-in attacks" the weapons allow, and the splatter, decapitations, dismemberment, skeletal bits and gore they cause, are simply too extreme (and freakin' awesome) for young gamers to handle. Valve, in its wisdom, also submitted an edited version of the game that cut much of the violence and bloodshed; that version was approved but remained a "backup plan," according to Valve boss Gabe Newell, to be employed only if the appeal of the original decision failed. Unfortunately, the magic moment has arrived and its not a good one for folks Down Under looking forward to some non-lame undead action: A three-member Classification Board review panel has unanimously voted to uphold the original decision to rate the game RC (Refused Classification). "The computer game contains a level of violence which is high in impact, prolonged, repeated frequently and realistic within the context of the game," the panel wrote in its decision. "In addition, it was the Review Board's opinion that there was insufficient delineation between the depiction of general zombie figures and the human figures, as opposed to the clearly fictional 'infected' characters. This was a major consideration of the Review Board in determining the impact of this game on minors." So the hideously deformed "special infected" are okay, but the ones who look like humans - that is, hordes of slavering humans charging headlong at you in a desperate rush to consume your living flesh - are a no-go? Yeah, I don't get it either. Valve hasn't yet confirmed whether this will force the release of the edited version of the game in Australia but it looks pretty much certain at this point. Assuming that's how it works out, it's an unfortunate but also unsurprising conclusion; as long as Australia insists on keeping its head buried in the videogaming sand, it's also one we can expect to see repeated in the future.